Finally, one night as Jethro listened to a far off owl “hoot” his haunting cry, he followed the sound and found what he was searching for…the most convenient spot in the Metro to build his Bacon Bacon restaurant, Jethro’s homage to Breakfast. This “most convenient spot in the Metro” is located at 1480 22nd St. in West Des Moines. If you haven’t been over in the area recently, it’s the old Hooters building. Myself and 2 other friends decided to grab lunch there on a Saturday – which also happened to be a Hawkeye Saturday. The place was packed so we ended up having a 45 minute wait. There are enough TVs when you first walk to be easily entertained. With it being a first time at a new restaurant there was plenty to take in other than watching TVs. There are tons of seats in this restaurant. You couldn’t even tell that it had been a Hooter’s bar. The menu is huge. If you thought deciding where to eat was a tough choice wait until you get here and grab a menu. It has 8 pages full of bbq, bacon and breakfast items. We had to keep telling the waitress a couple more minutes each time because the minute you had something picked out you would turn the page and find something else that sounded just as amazing, if not better than what you first saw. I avoided the burgers because the plan was to go to Zombie Burger for dinner that night. 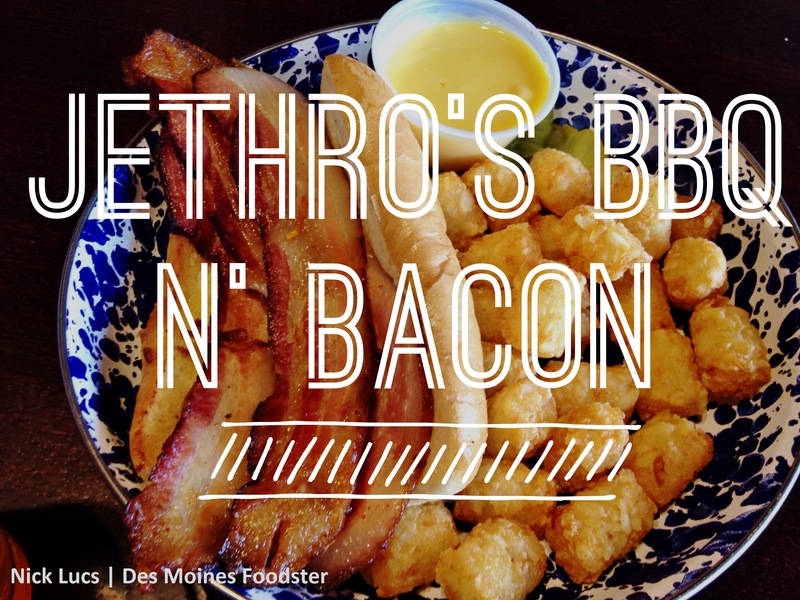 Yeah, you’re thinking Jethro’s BBQ n’ Bacon AND Zombie Burger in the same day? It almost happened. Anyway. I ordered the The Bacon Bacon Steak Sandwich. The waitress did notify me that the sandwich does NOT have a steak with bacon on it. It is literally a bacon sandwich with a hoagie bun. The bacon though was indeed cut pretty thick and three slices was enough to make me full and literally feel like bacon grease. The tater-tots were SO GOOD. You think you could snarf down a sandwich like that but friends, let me tell you, thick-sliced smoked bacon on a hoagie bun goes down a little slow. Thanks to my Des Moines IPA from Confluence Brewery, I was able to get’r down a little easier. Next time I order this I’m going to ask for mayonnaise, lettuce and tomato because this sandwich could easily turn into one hell of a B.L.T.! Please, call it the Foodster BLT. Thanks. Half pound of fresh, ground Angus steak, grilled to perfection, an order of thick slab bacon and blue cheese. Texas brisket, bacon, Swiss cheese, sauteed mushrooms and onions on grilled rye toast with 1000 island dressing. Fun time, good food. I’ll be back for breakfast — and beer but definitely not the Adam Emmenecker Challenge.